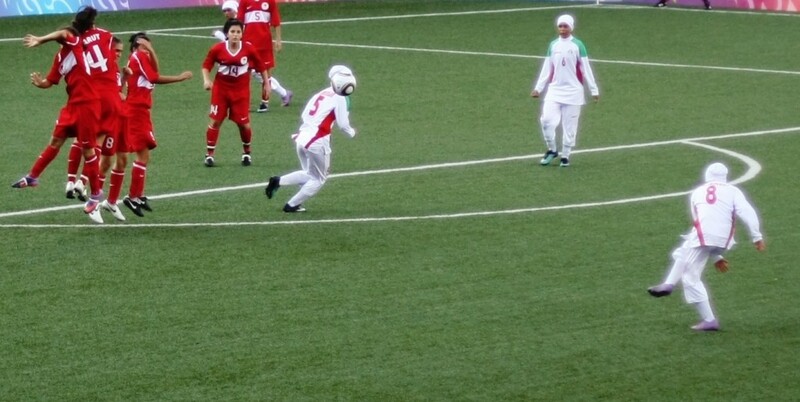 Gender and Travel: Iranian star footballer unable to compete because husband refused permission to travel. Iran’s female football team Captain, Niloufar Ardalan, has been unable to compete in an international tournament because her husband refused her permission to renew her passport. Image: Singapore 2010 Youth Olympic Games Football, Iran vs Turkey by Monfie licensed under the Creative Commons Attribution 2.5 Generic license. The rights and abilities of women to travel and move freely – whether international travel or local movement around their own neighbourhoods – have been and continue to be restricted in comparison to their male counterparts in many cultures around the world. Historically, some societies have imposed curfews on women, for example in Joseon Dynasty Korea (14th – 19th centuries), where upper class women were only allowed out of their homes after dark. In a number of countries, women are not allowed to leave their homes without a male guardian, and it has been recently reported that ISIS are imposing these sorts of restrictions on women in areas they control in Syria. In Saudi Arabia, women are officially required to have written permission from their male guardian allowing them to travel outside their home, although in practice this is not always enforced. Saudi women are also forbidden from driving due to edicts from leading religious clerics in the country. With many public transport options unavailable to women – either due to legal restrictions or social attitudes – and conventional taxis risky and disapproved of (since they bring women into contact with non-related males), women in Saudi Arabia are turning to digital technologies to find ways to ease the limits on their mobility. According to the LA Times, apps from companies like Uber allows users to book rides, track their ride on GPS and view the driver’s customer ratings, making women feel safer; and, since they don’t look like taxis, the social stigma of not travelling with a male guardian is more easily avoided. These benefits are popular with women: over 80% of the users are women, according to the app companies. But the rides are still expensive and therefore only an option for those with the means to pay. Even within more gender equal societies such as the UK, there are gender differences in attitudes to travel. Some groups, including the international protest group Take Back the Night, argue that fear of sexual violence can limit women’s perceived freedoms and rights to travel freely and unaccompanied. Recent research in a report from the Independent Transport Commission (ITC) shows that attitudes about perceived costs and safety lead men and women to make different choices about whether to drive, take public transport or cycle.¹ Whilst these are not directly imposed restrictions like those in Saudi Arabia, this research highlights the myriad effects of cultural attitudes that can in effect restrict, or at least shape, travel behaviours. Without the ability to travel freely and independently, people’s lives and opportunities can be severely curtailed, whether that be the opportunity to compete in an international sporting event, to earn a living, attend school, participate in public life, or even gather food and water. With this in mind, freedom of movement is a right enshrined in the laws of many countries and in international human rights law (article 13 of the Universal Declaration of Human Rights). As these examples show, for many people in this world – and disproportionately for many women – freedom of movement is denied. And yet, these examples also show that many people need and desire to move freely and that they will find new ways to try and do this. As the women in Saudi Arabia use smartphone apps to improve their mobility, and as Iran’s female football Captain appeals for changes to the law via online media outlets, we see how new technologies are being used to push back against restrictions on movement. These issues are a central concern to the Independent Transport Commission’s Why Travel? Project, which aims to understand better our motivations for travel from a broad range of perspectives. The project looks at psychological and biological drivers as well as the economic, cultural and social structures we have created that all enable, control and shape our travel behaviour. Ultimately, this deeper understanding will help us to make better decisions in future regarding human travel and transport, and the myriad areas of life which travel touches on. For more information on the project, including news and expert views, see www.whytravel.org.